We have 11 activities for your Oscar week. Do the better movies make the most money - Updated! - Do the the movies that are nominated for the Best Picture at the Academy Award make the most money? At most ten movies are nominated each year. Students compare the votes that the last 18 nominated movies received with their worldwide gross in theaters. Does number of votes for best picture correlate with money earned at theaters? Highest Grossing Movies - Let your students develop their own ideas about compounded percent change while they have the opportunity to speak about the upcoming Academy Awards show. Worldwide box office income is compared for the top ten grossing movies of all time. Is total gross the most appropriate way to judge the popularity of a movie? How does inflation and increasing ticket prices come into play? Inflation rates are used to let students calculate how the money of 1997 compares to the money of 2013. Students see for themselves what exponential growth means. Opening Weekend - Students compare the data from the "Opening Weekend" gross to the "Total Lifetime Gross (Domestic) of several popular movies. The activity is accessible for any student who can plot points on a grid, so it could be used for students as young as 4th graders. Older students can create a line of best fit and equation to model the data and make predictions. By plotting and analyzing the data students decide if they can, in fact, predict the future. Pixar vs Dreamworks - Animated films are a billion dollar industry. The two biggest producers of animated films are Dreamworks and Pixar. The two have been going head to head for over ten years. So how do they stack up to each other? Which company is making more money on their films? According to critics, which company makes the better films? Movie ticket costs over time - Updated! - Students check out the changes in movie ticket prices over the last 30 years. Using a scatter plot (or his data) students analyze rates of change, make predictions about the future ticket costs, guesses about past costs and try to create lines of best fit. Money making holiday movies - Students analyze holiday movie data. They will round, estimate, compare, calculate percent increase, consider the most appropriate graphical representation and graph the data ... along with sharing what they have seen and enjoyed. 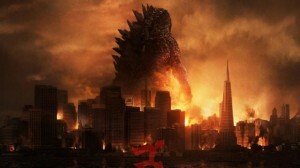 Godzilla - Since 1954 when the first Godzilla movie was made, the creature has grown. Students compare Godzilla's height with the height of recognizable buildings and judge whether his height is accurately portrayed. Scatter plots, data analysis, sequel predictions. Rapunzel - Students learn a little bit about the original Grimm fairy tale and a little about the incredible animation in this Disney movie, Tangled. They calculate the weight of Rapunzel's 70 feet of hair and do some converting from meters to feet. This activity lets students use rate and percents as they consider really long hair and a pretty good movie. How many movies can you see in one day - With plenty of days off from school, plan to spend a day at the movie theater. You want to see as many movies as possible. Robert Kaplinsky shared this lesson with us. Students are asked to analyze a situation, consider contributing factors, and present a logical solution. Which is better ... original movies or their sequels? - From our gathered data students debate the question and consider what they can conclude from various graphs and what is an adequate sized random sampling is adequate. Fantastic Beasts - How much does it cost to make a Harry Potter movie? - In this activity students use the average cost of making a Harry Potter movie to estimate the cost of creating the "Beasts" movie. The task is open, in that it asks students to analyze central tendency, using either median, mode or mean. Which is the best predictor of the cost of making this new movie? ← Which car should I buy?